I made a scarf for my friend Janis Lane-Ewart, executive director of KFAI radio and host of the weekly jazz program "Collective Eye." 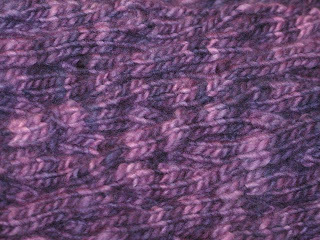 The yarn is Malabrigo, a kettle-dyed Merino wool from Uruguay. The pattern is "Here and There Cables" by Norah Gaughan from Scarf Style. My patient friends at Linden Hills Yarn helped me choose the pattern, the yarn, and the right cable needle. It took four skeins, I stranded the yarn (to avoid clumps of color that can happen with hand-dyed yarns), and I thought it would never end but it did and Janis likes it. Photo: A close-up of the pattern. Purple waves.